Macaroni salad is a staple of any summer cookout. But horror fans can put a morbid twist on this old standby, by putting that brain gelatin mold to use. Macaroni salad is a staple of any summer cookout. 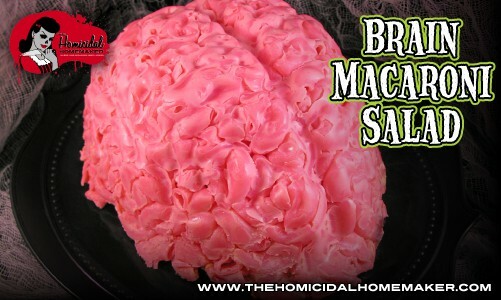 But horror fans can put a morbid twist on this old standby, by putting that brain gelatin mold to use and making my Brain Macaroni Salad. Yes! 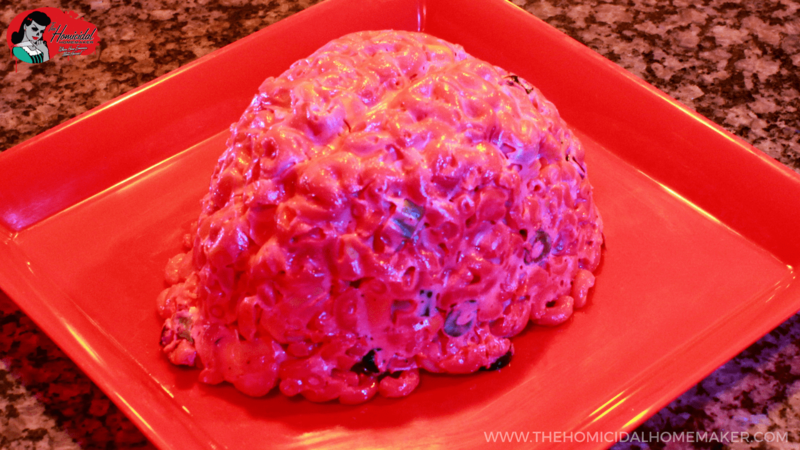 You can use your brain gelatin mold for much more than just JELL-O! Not only is this Brain Macaroni Salad recipe incredibly easy, but it’s very inexpensive to make…and I guarantee that your friends will be surprised! It is also super easy to customize it to your liking – if you don’t care for mayonnaise, feel free to replace it with Miracle Whip or a homemade dressing of equal proportions. I also used black olives, dill pickles, and cheese cubes in mine, but it is really easy to swap out the ingredients. Have fun with it! Don’t be scared off by the addition of unflavored gelatin to the dressing – you’re not going to be serving gelatinous macaroni here! The gelatin just helps to hold the Brain Macaroni Salad into the brain shape. Those of you who have followed my blog/website for the past few years, are probably familiar with my original Brain Macaroni Salad. I’ve played around with the recipe, and developed a new recipe that doesn’t include a cream cheese based dressing. Both recipes are available here on my website. First, cook your macaroni with food coloring, and allow to fully cool. You can use whatever color you like; I used hot pink because I wanted it to really stand out while on the table. Then prepare your dressing. Start by combining the mayonnaise with the yellow mustard, paprika, salt, and pepper, and mix until combined. Then add in enough food coloring gel so the dressing is close in color to the macaroni. In a small bowl, mix together your gelatin and 1/4 C of boiling water. Mix until smooth, and then set aside to cool for about 5 minutes. After it has cooled, add it to the dressing. Then pour the dressing over your cooled macaroni; stir in the olives, pickles and cheese. Mix until combined and fully coated with the dressing. Spoon the mixture into your gelatin mold. After it is completely filled, cover it with plastic wrap or foil, and press down. Then place it in the refrigerator for around 3 hours. Placing a small plate with a couple of cans on top will help to compress it into the mold and weight it down. When your brain macaroni salad is ready to serve, simply invert it onto a serving platter. You might need to loosen the edges with a knife and gently pull on the mold to get it to come loose. And that’s it! Serve, and enjoy! Previous articleStay as “Cool as a Corpse” with Cookies and Scream Tombstone Popsicles!